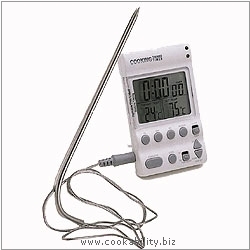 Versatile cooking timer for precise meat and poultry cooking. For use in ovens, barbecue grills, deep fryers and boilers. Displays an instant digital readout of the inner temperature of food during cooking. Automatic alarm can be preset to sound when the food is cooked. The thermometer measures from 0° (32°F) to 200°C (392°F). Heat resistant stainless steel probe which goes into the food whilst cooking and the digital reader stays outside the oven. Requires AAA battery, included.